UND President Mark Kennedy talks to members of the University of North Dakota Alumni Caucus about goals and initiatives he would like to bring about on the Grand Forks campus. 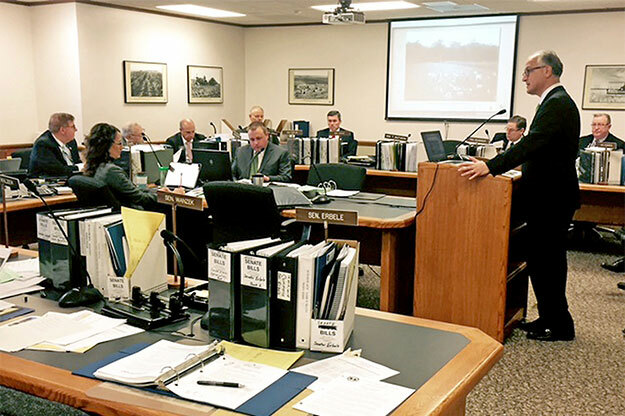 Kennedy made similar points to the Senate Appropriations Committee on Monday at the State Capitol in Bismarck. Photo by Shawna Schill. University of North Dakota President Mark Kennedy isn’t interested in making lemonade out of lemons. He prefers swapping onions for strawberries. On Monday the first-year UND leader bookended a nearly 40-minute presentation to members of the Senate Appropriations Committee by highlighting two historical portraits hanging in the committee room: one, at the beginning, of farmers harvesting onions, and the other, to conclude his talk, of strawberry pickers displaying their bounty. His testimony addressed Senate Bill 2003 funding the University System in the next biennium. The symbolism of the portraits in his presentation served to drive home a point, each in its own way. 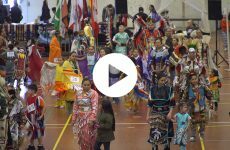 “As we think about the budget numbers before us and the cuts (UND) has already taken — about $30 million last cycle — it could, like when cutting onions, bring tears to your eyes,” Kennedy told the gathering at the State Capitol. “But rather than cry before you today, I would rather celebrate the things that you and your predecessors have done for us” — founding and investing in UND. 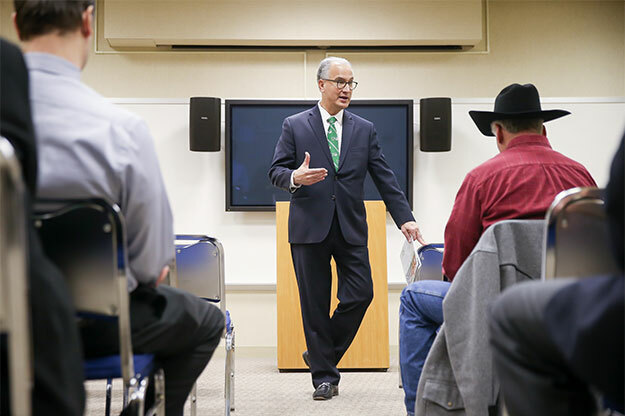 Between the two examples, Kennedy laid out how UND is the chief opportunity engine for North Dakota and North Dakotans, making the case for the benefits UND delivers to the state and its citizens. As the premier flagship University in the Northern Plains, UND is delivering these opportunities by growing the talent needed to fuel the economy, he said. UND also is a key driver in diversifying the state’s economy so it can be less dependent on the prices of oil and wheat. 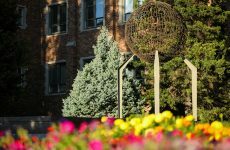 Furthermore, he said, UND is collaborating with the private and public sectors on research and job growth. 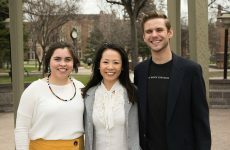 In this regard, UND is focused on a number of what Kennedy refers to as “Grand Challenges,” such as energy security and sustainability, healthcare delivery in rural areas, management and security of information technology in the era of Big Data, and continued innovation in unmanned systems. UND’s research enterprise isn’t only important for economic diversity; it’s a bargain for the state, Kennedy said. In 2016, for every $1 in research funding that UND got from the state, it brought in $6 from other external sources, creating $146 million in economic impact. Kennedy also took time to applaud the legislature for its support of matching programs over the last two biennia that raised money for much-needed student scholarships and faculty support. UND has used the state’s Challenge Fund to raise about $33 million private donations, which were matched with $16.5 million in state money to support students and faculty. UND has also started chipping away at the estimated $500 million in deferred maintenance costs to aging buildings on campus. He said UND was able to take $4.4 million from the Legislature in the last biennium and matched it with $8.8 million in University funds to make repairs to buildings such as the Chester Fritz Library and O’Kelly Hall. Kennedy addressed the potential need for further cuts that might be mandated from the Legislature in the future by reporting that UND units already have been asked to provide reduction scenarios at the 4, 8 and 12 percent of fiscal year 2017 level. When it comes time to make decisions on how much each units’ budgets are reduced, he said, they won’t all be treated equally; rather, they will be judged on how much opportunity those units are generating. Kennedy stressed, however, that it’s not all about cutting. As part of UND’s ongoing Strategic Planning Process, the University is re-examining its priorities and looking at ways to invest at the same time it is reducing expenditures. In this area, UND is looking at doubling the number of experiential learning opportunities (internships, service learning, undergraduate research, study abroad, etc.) for its students, using predictive analytics informed timely interventions to help increase graduation rates, and continuing to expand research to address the Grand Challenges. Brandon Beyer, UND student body president, joined Kennedy at the Senate hearing and told committee members that UND has put a high priority on making sure students have been involved in the Strategic Planning process and other important decision-making moving forward.